Mounted (Matted) Photographs ONLY - Framed Photographs NOT allowed. **The Orchid Society of Alberta and the Enjoy Centre will not be held responsible for any damage or loss of displayed photographs. All entries displayed are at owner's own risk. The use of tripods will be permitted in the show area on Sunday, April 7 from 10:00 am to 1:00 pm only. Handheld and Mono-pod photography is fine at anytime. Doors will open an hour earlier on Saturday for Photographers ONLY at 09:00 am. Please use Entrance 1. 2. No prints larger than 24” x 36”. 3. All entries must have an orchid or orchids as the dominant part of the illustration. 4 .All entries must be single photographs. No collages. 5. Photos cannot contain any visible identification, copyright, or watermark. 7. Each photograph must be suitably identified by picture title and name and phone number of the entrant on the back. All pictures will be tagged during the show with the picture title and entrant’s name. If you wish to keep your identity confidential please let me know and we will put “anonymous” instead of your name. If you wish, you can attach a photography business card under your prints for sale after judging is completed. 9. Late entries may not be displayed due to space restrictions. 10. Judges will be experienced and qualified. 11. 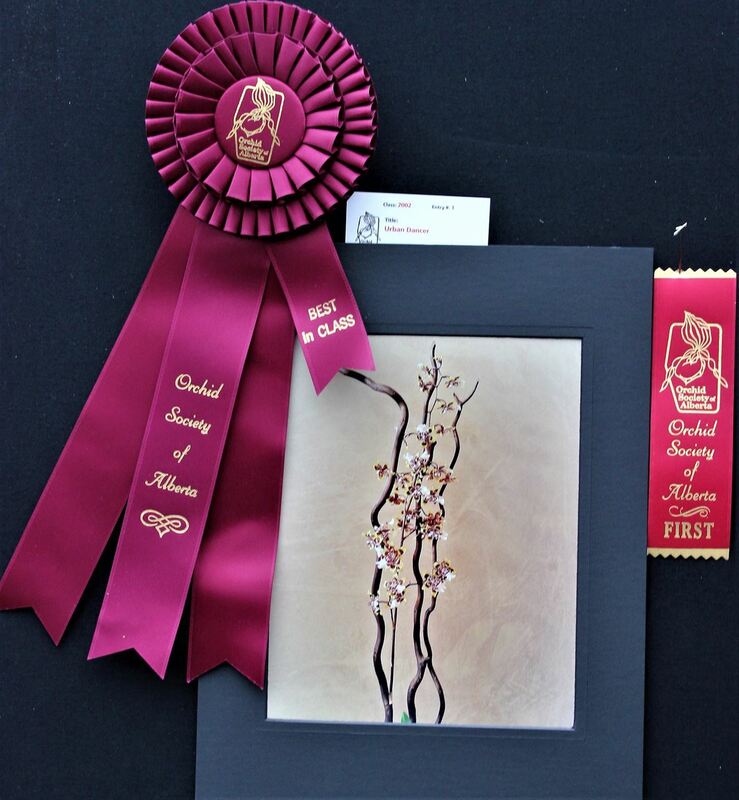 Ribbons will be awarded for First, Second, and Third place in each class and Overall Winner. 12. No limit to number of entries per person. 13. Photographs can only be entered once every 4 years for judging. Any entries for 'non-judging'are welcome. 14. All entries are to stay in the photo display for the duration of the orchid show. 15. Deliver all entries to the Enjoy Center, 101 Riel Drive, St. Albert on Thursday, April 04, 2018 between 2:00 and 6:00 pm. 16. All photo entries must be picked up after the show at the Enjoy Center, 101 Riel Drive, St.Albert immediately after the show on Sunday, April 7, 2018 from 4:00 – 5:00 pm. No early pickups. N.B. If entries are left past the pickup time listed there will be no guarantee that the entries will be returned. 17. For Photographers - Tripods are allowed in the show area on Sunday, April 7 ONLY from 10:00 am – 1:00 pm.